WikiLeaks founder Julian Assange surrendered to British authorities last week. He is set to appear in court Tuesday. London (CNN) -- A secret grand jury in Alexandria, Virginia, is meeting to consider criminal charges in the WikiLeaks case, an attorney for the site's founder, Julian Assange, told the Al-Jazeera network in an interview. "We have heard from Swedish authorities there has been a secretly empaneled grand jury in Alexandria. ... They are currently investigating this," Mark Stephens told Al-Jazeera's Sir David Frost on Sunday, referring to WikiLeaks. The site, which facilitates the disclosure of secret information, has been slowly releasing a trove of more than 250,000 U.S. diplomatic cables since November 28. U.S. Attorney General Eric Holder said last week that he had authorized "significant" actions related to a criminal investigation into WikiLeaks' publication of the cables but has declined to elaborate. Assange is sought for questioning in connection with allegations of sexual assault in Sweden. He surrendered to British authorities last week. "I think that the Americans are much more interested in terms of the WikiLeaks aspect of this," Stephens told Al-Jazeera. He said it was his understanding that Swedish authorities have said that if Assange is extradited there, "they will defer their interest in him to the Americans. ... It does seem to me that what we have here is nothing more than a holding charge." The United States just wants Assange detained, he said, so "ultimately they can get their mitts on him." "He is entitled under international law, under Swedish law, to know the charges or the investigation that's going on, the allegations made against him and the nature of the evidence which is said to support it," Stephens said. "As I sit here talking to you now, he hasn't that that information, so he's not been able to comprehensively rebut (the allegations)." Is WikiLeaks founder a journalist? Assange is next set to appear in court Tuesday. Stephens said his client is ready to meet with the Swedish prosecutor if she travels to London, but she has not done so. The legal process could be a long one, he said. "There are a number of issues in this particular case which raise European Convention and human rights points." Meanwhile, The U.S. House Judiciary Committee plans to hold a hearing Thursday on "the Espionage Act and the legal and constitutional issues raised by WikiLeaks," according to its website. More details on the hearing and a witness list had not been posted as of Monday morning. Before WikiLeaks began posting the cables, Assange wrote to the United States and told them he did not want to imperil any ongoing operations or put anyone at risk, Stephens said. Redactions put in place are not seen to have exposed anyone to risk, he said. Beside the United States, WikiLeaks has apparently angered Russia and China, Stephens told Al-Jazeera. Russia has accused him of being a CIA operative, according to the attorney, while cyberattacks against WikiLeaks have appeared to come from Russian and Chinese computers. 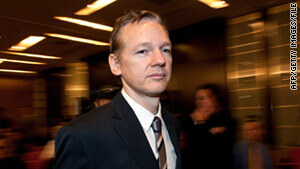 "He does seem to have picked enemies, if you like, with the three major superpowers," Stephens said of Assange. Last week, supporters of WikiLeaks calling themselves "Anonymous" and "Operation Payback" claimed responsibility for disabling or disrupting the websites of MasterCard, Visa and PayPal. The group tried unsuccessfully to bring down Amazon.com, saying on Twitter, "We don't have enough forces." Anonymous made the attacks not through hacking but by directing a giant traffic surge to the targeted website in a distributed denial-of-service, or DDoS, attack. Such attacks are hard for most websites to defend against, and they can significantly slow or crash a website.